Everyone here at Ryson would like to wish you a fantastic and fortuitous happy new year. As 2017 draws to a close, Ryson President and CEO, Ole Rygh looks towards 2018 with this letter. Ryson International was founded in 1995 and specializes in Vertical Conveying Solutions. We manufacture a full line of Spiral Conveyors that satisfy most vertical conveying needs. 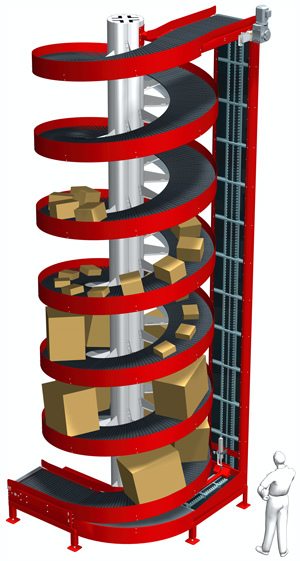 Ryson Spirals need less floor space than conventional incline conveyor and are faster and more reliable than any elevator or lift. The economic climate is improving and we have several new products coming on line… We are committed to a continuous product improvement program. Our new Wide Trak Spirals are in response to our customers’ need to handle bigger loads and reach higher elevations. Available with 30” and 36” wide slat belts. They can accommodate an elevation change of up to 50 feet with only one drive. Our new Narrow Trak Spirals are super compact vertical conveyors designed to handle small loads at speeds in excess of 200 fpm. A new nesting slat can reliably end transfer small cartons and packages or side transfer small bottles and containers in a single file or in a continuous mass flow. They come in 6” and 9” wide slat belts. Quality and service comes first at Ryson. We are the number one manufacturer of Spiral Conveyors in the USA. Ryson products are crafted with great care in our modern Yorktown, Virginia manufacturing plant. Our full inventory of spare parts enables us to provide the high level of service our customers have come to expect. We are dedicated to provide products and service that will help reduce our customers’ cost of ownership. A large portion of our new orders come from existing customers. It is always gratifying when our customers come back for more, because it validates that they are satisfied with our products and service. Our rapidly growing customer list contains names of small and large companies across a broad spectrum of industries. The new Ryson Wide Trak Spirals are in response to our customers’ need to handle bigger loads and reach higher elevations. 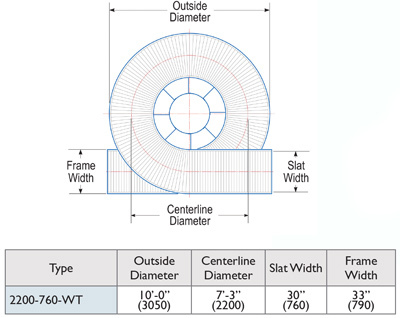 These spirals can handle a variety of load sizes, big and small with their 30′ wide slats. They are ideal for warehousing and order picking operations. The Wide Trak Spirals can handle double the weight capacity of our standard spirals, and can provide an elevation change of up to 50 feet with only one drive. The Wide Trak Spirals can optionally be configured to allow loads to enter and exit the spirals at several intermediate elevations. New special induction and divert out conveyors have individually adjustable conveying surfaces to match the spiral pitch, assuring a safe and reliable product transfer. The Ryson proprietary slat belt enables a low rolling friction operation without any sliding movements or wear strips. The belt is pulled by a heavy duty steel roller chain and the slats are supported by precision steel roller bearings which ride on a polyurethane surface. This arrangement effectively takes up the side forces created by a tight radius and at the same time increases the load carrying capacity of the belt up to 75 lbs per linear foot. This enables the spirals to start and stop fully loaded and can run at speeds up to 200 fpm. The slats are overlapping and provide a reliable and safe conveying surface. The Ryson value proposition is to deliver products with a low total cost of ownership. Ryson Spiral Conveyors need less floor space than conventional conveyors and are also faster and more reliable than any elevator or lift. All Ryson Spirals are designed for low maintenance and long life. Only high quality components are used throughout. All bearings are sealed for life and need no further lubrication. The chain is of heavy duty nickel plated construction and as a result, needs only infrequent lubrication. The slats are made of a nylon composite, and need no maintenance and can easily be replaced as single components without the use of special tools. If you would like moreinformation about Ryson’s New Wide Trak Spiral, please visit www.ryson.com or dowload the product spotlight.